"3LA1, V-1124" by Timothy K. Perttula and Robert Z. Selden Jr. CONTEXT INFORMATION: Found in a plowed-up grave with V-1122 to V-1136 and V-159 to V-162. DECORATION: The upper rim panel has a single row of small excised punctations under the rim as well as three horizontal engraved lines. The lower rim panel has two centrally-placed appliqued nodes above the carination, with a hatched engraved half circle around it. Completing the engraved-appliqued motif are opposed vertical cross-hatched and vertical engraved lines (in sets of three) on either side of the engraved half circle and node. There is a white kaolin clay pigment in the engraved and excised punctation elements. Belcher Engraved, var. 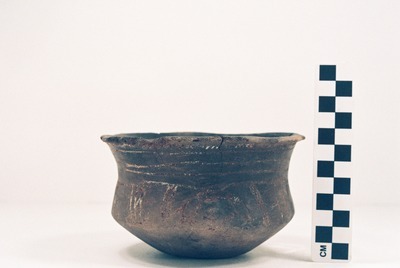 Belcher vessel (5425-741): a, photograph; b, drawing by Bobby Gonzalez.